chuck taylor II | DressCodeClothing.com's Official Blog. Converse has revamped their classic All Star silhouette. And we like it. 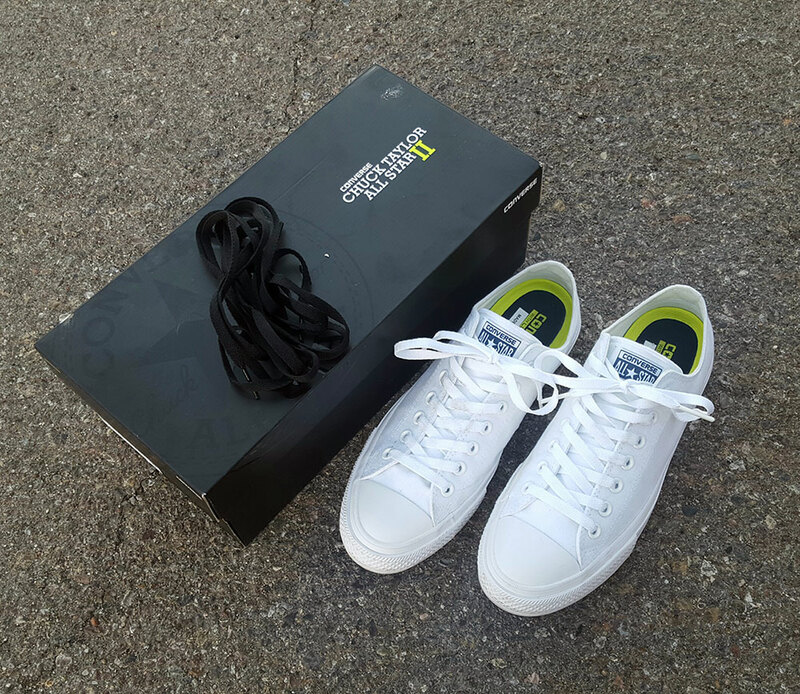 In this post I will address the similarities and differences between the new Chuck II and the original Converse All Star. The first big change is the new box. The construction is sturdier and the box just seems more solid. The branding on the top of the box is a nice change from the plain black top on the old boxes. Once we popped the box open, another little change took us by surprise; The All Star II’s we got included an extra pair of laces. Little touches make all the difference, don’t they? the new Chuck II with extra pair of laces and the new Box. The most noticeable change between the classic Chuck Taylor All Star’s and the All Star II’s is the extra padding all around. From the new insole that’s included, to little bits of extra padding on the tongue and around the heel; the Chuck II’s are definitely more comfortable. The basic construction of the shoe hasn’t seen much change. So, anyone who is used to the old silhouette of the Chuck Taylor’s and is worried about the new style of the All Star II being too different can rest easy. Also, the sizing has remained the same, which is good news for fans of the classic Chuck Taylor’s. For the uninitiated, click here to see our sizing guide for converse chucks. Let me stress that these Chuck’s are much more comfortable. They are now sporting Nike’s Lunarlon insole, which is a lightweight, removable option as opposed to the old model’s unwavering, flat footed insole. Another addition is perforated micro-suede padding on the inside of the tongue, as well as on the sides and heel of the foot bed. Not only does this provide an extra layer of comfort, this also keeps the foot in place a little better inside of the shoe. Another little change that goes a long way is the addition of an elastic band to the tongue of the shoe. Again, this keeps the tongue from shifting around as you wear them and helps keep the foot in place, as well. The biggest aesthetic changes are incredibly subtle, if not downright unnoticeable. The tongue on the All Star II’s now has less of a raw edge, and instead has a heavier lining stitched to it. The solid piping on the sole is now striped. The eyelets seem to be a little sturdier. They look practically identical. Practically. Somehow, the All Star II’s look more solid. Perhaps it’s the higher quality canvas they used, or maybe the extra padding adds an extra layer of support for the shape of the shoe. All of these changes do come with a price, though. The Chuck Taylor All Star II’s are about twenty dollars more than the classic Chuck Taylor’s. They are also not available in all of the cool colors and textures as the classic All Star’s. They are also only available at select retailers right now. Right now the options for the new model are fairly limited. However, fans of the classic black and white, grey and white, or white on white Converse have nothing to worry about. Overall, these are a great addition to the Converse family of shoes, and will be a great addition to my collection .